I love me a series. Investing time into a book then getting to dive right in to the sequel with characters you love is just about the best thing when it comes to being a huge book reader. 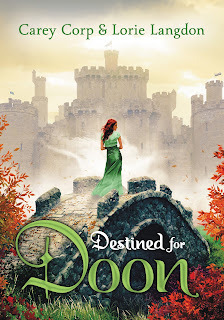 Now that we are into summer it is the time of year I like to devour books and I totally did with Destined For Doon by Carey Corp & Lorie Langdon. It is hard to describe time in the Doon books because in Doon things move slower than actual regular time so let me start to say for Doon some time has passed but in our time months have passed. MacKenna is in Boston living her life when Duncan shows up. I have to say I loved Veronica in the first book but Kenna aggravated me based on the decision she made. So to see her back and have Duncan drag her back to Doon was a relief. We really got to explore her character this book and I'm loving getting to know her. Of course this book has turmoil and end of the world stuff plus romance. The girls are getting used to their new way of life amidst all of this. It was really an engaging story. Doon has experienced some changes with our dynamic duos appearance and Veronica being Queen. I think overall it works because I imagine every 30 years the kingdom would have some growth as newcomers enter. Another thing I loved about this book and Doon in general is that this is a pretty clean read. There is a bit of kissing between couples but overall it is decent. One character drinks a bit but regrets it and it is not at all glorified. That makes me happy as a mom of teens - Blink has really done well keeping the stories age appropriate but still delivering on solid plot and characters. I honestly don't want to give too much away - because you should read book one first then dive into this gem but I can tell you that you will not be disappointed! In this sequel to Doon, Mackenna Reid realizes she made a horrible mistake–choosing to follow her dreams of Broadway instead of staying in the enchanted land of Doon. To make everything worse, she’s received her Calling–proof she and Duncan are each other’s one true love–and it’s pure torment, especially when visions of the very alluring Scottish prince appear right before she goes on stage. So when Duncan tells her an ancient curse threatens to overtake Doon and the new queen needs her to return, Kenna doesn’t have to think twice. With darkness closing in on all sides, Kenna and Vee must battle a world of nightmares in order to protect the kingdom. But it will take the ultimate test of courage for Kenna to salvage her happily ever after. Purchase your copy of Destined For Doon at your local book retailers or online at stores like Amazon.